The Internet is no longer a rational space driven by facts and reality. With the emergence of social media and constant connectivity, the Internet is quickly taking on a character of its own, but fluxing and changing daily. In order to keep up with the constantly changing worldwide web, business owners need their websites to quickly and efficiently bring customers in. The use of user experience (UX) designing for emotions enables businesses to take their websites to the next level in today’s growing Internet world. The Importance: Why even think about designing for emotions? Human beings are emotional creatures. We are drawn to things that make our hearts beat faster, our eyes tear over, and our hands clench in fear. We are driven to images that we view as cool, interesting, and beautiful. UX designing for emotions takes these natural human characteristics and uses them for the advantage of website design or app design. The product is then a website that users view not as a machine, but more as a person who wants to have a relationship with them. 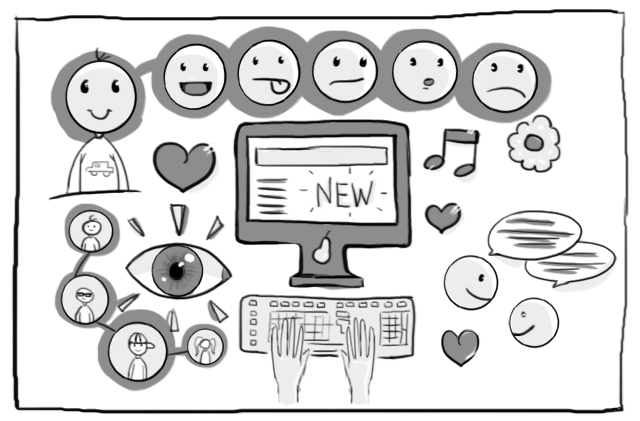 So, what can you do to make sure you create an enjoyable and emotional connections with your website or product users? Here are some quick wins for you. The use of written and visual humor, such as cartoons, has been proven to connect users to various companies. When you’re watching TV, most of the time you remember the humorous commercials, the commercials that made you laugh, more than the more serious ones. The same principle applies to websites. 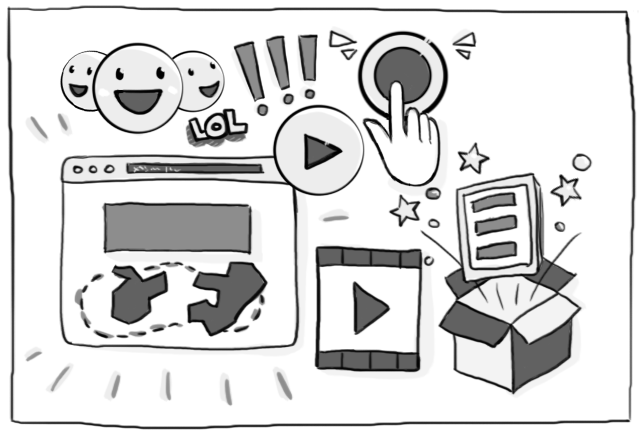 You’ve probably noticed bunch of hand-drawn sketches around our website too. As humans, we are drawn to things that we can relate to. We also find beauty in proportions that are regularly used and recognized. For instance, many web developers are experimenting with the use of the golden ratio in website design. Think Fibonacci’s sequence and the shape of a seashell. Visitors to your site are more likely to return again if you engage them in some way whether through some sort of visual stimulation (video, graphics), customization, or interactive tool. Finally, in today’s social world, we are connected to each other more than ever. As a result of this connectivity, we value authentic, relational communication. So, use UX design and rely on the emotions to communicate with your users in a way that tells them that you want to be their friend. Or business partner. Or both. In any case – it’s the relationship built on emotions that matter. Tone of voice and word selection go a long way in accomplishing this goal. All these characteristics of UX designing for emotions may seem pretty lofty to reach to, but let us reach them for you! Here at UX Passion, we can provide the services that you need in order engage your users and keep bringing them back for more. Remember, it’s about building authentic and trustworthy relationships. Additionally, if you want to learn more – you can take a look at Arron Walter’s book: Designing for emotion – it’s a good read and we recommend it! Developers, UX is not UI, learn that and stop trivializing!